For laptops, battery life is one of the most important point to determine it's usability, the longer is better. Bad linux power management profile could dramatically decrease the battery life, really, from 5-6 hours in windows to 2-3 hours in Linux, ultimately newbies will say Linux is very power hungry ! Most modern laptops uses the ACPI for power management, it's much more flexible than old APM and managed by the OS, instead of BIOS. You don't need to worry about ACPI, it's already well integrated with Linux. Here in this tutorial we are going to focus on normal usage like browsing, video and audio playback, word processing, note taking etc. etc, rather than totally idle state or heavy tasks like gaming. Which Linux power management methods are worth to implement ? How to track power usage and optimize Linux power management ? This is a comprehensive list, there may be some useful power saving tweaks missing. Let's dig a little deeper with those options above. Low or weared out Laptop battery ? Here how you can show alerts on low battery automatically. If you are using a laptop with switchable discrete graphics card, make sure it's turned off. This could be the biggest cause of power drain, almost tripling the power use than normal. So how to turn off the discrete GPU ? It depends on your GPU and the Linux distro you are using. It's one of the first thing to do after installing ubuntu or any linux distro. If you are using a NVIDIA Optimus GPU and running a Debian or Debian derivative, have a look at this guide, Configure NVIDIA Optimus in Debian with bumblebee . For Ubuntu and Linux Mint, have look here, Ubuntu nVIDIA Optimus setup . If you are using AMD hybrid/switchable GPU and running Ubuntu or any Ubuntu derivative, look at this guide. The vgaswitcheroo module could be handy, just run the commands bellow to turn off the discrete graphics. Note: The vgaswitcheroo may not be always available. Laptop's backlight is another major power consumer, reduce display brightness to a comfortable level, which should match the ambient light. Most laptops could adjust display brightness with dedicated hot keys. If you are using KDE, Gnome, Cinnamon, Unity and other heavy weight desktops, it should work out of the box. You may need to add the acpi_backlight=vendor boot time kernel parameter to the GRUB configuration for proper hotkey function, also don't forget to update GRUB after adding this. Though in lightweight desktop environments, hotkey functionality may not be available. In such case use the xbacklight app to manage display brightness. Casual tasks like browsing, reading pdf, playing audio doesn't require massive CPU power, so under clocking the CPU saves a lot of power. Frequency scaling can intelligently scale up or down the CPU frequency according to need, or it could be set by user. Probably need not to change anything here, as Linux kernel loads powersave or ondemand scaling governor by default, they are quite power saving and tries to always keep the CPU frequency lower. If you are using Ubuntu and Unity desktop, there is a nice unity panel applet, indicator cpufreq. Intel Sandy breeze or newer CPU uses the intel_pstate cpu scaling driver after kernel 3.9, it provides two CPU scaling governor, performance and powersave which is somewhat better than acpi_cpufreq driver. If you are using a Intel turbo boost capable CPU, you may want to disable this facility while running on battery power. Laptop hard drives could consume up to 2.5 watt power, depending on task. So spinning down hard drives during low I/O activity period could save a descend amount of power. Though power saving by hard drive spin down is controversial, as it causes lagging and spinning up the drive requires power surge. Now you could try to save some power by lowering the APM level, really works when very few apps are open and web browser is closed. If you are using an external USB hard drive and it's idle, i.e. just plugged in, you could completely spin down it to save a lot of power. If sole purpose is to play movies and watch youtube, you should use hardware accelerated video playback when possible. It off loads the video decoding task to GPU, thus reduces CPU usage and ultimately saves some power. Media players like VLC, MPV or recent version mplayer support hardware accelerated video decoding. Try Baka-Mplayer, a lightweight mpv based media player with GPU accelerated video decoding support and nice Qt 5 based user interface. You should also use a browser with GPU acceleration support, most modern browsers like Chromium, Firefox, Opera supports it, here is how to enable hardware acceleration in any chromium based browser. Avoid playing flash videos in browser, as it doesn't support GPU decoding there. To disable bluetooth in Linux by blacklisting related kernel modules, create a text file /etc/modprobe.d/no-bluetooth.conf and put the blacklist files bellow there. You could block the webcam in the same way, create a text file /etc/modprobe.d/no-webcam.conf and put the blacklist configuration there. You should also disable other unused devices too, like inbuilt GSM module or fingerprint scanner, if your laptop have any. If you are not playing audio files frequently, put the sound card in idle state. As a temporary test, you could run the command bellow as root. To make it permanent, find the Audio device, usually it's connected through PCI-E interface. Note the PCI Bus ID and identify the kernel driver in use. If you are using a Intel HDA sound card, create the /etc/modprobe.d/idle-audio.conf kernel driver configuration file and put the configuration bellow there. Add some extra kernel parameters to the GRUB configuration to make the system even more power efficient.It could be done in different ways, in Ubuntu or Debian add the extra parameters to the /etc/default/grub file inside the line GRUB_CMDLINE_LINUX_DEFAULT="quiet" . Don't orget to run sudo update-grub after adding those kernel parameters. Now disable some features through the sysctl.conf file, add the configurations listed bellow to the sysctl.conf file, you need root privilege to edit the file. Add kernel.nmi_watchdog=0 to disable NMI watchdog, it's useless for most users. Add vm.dirty_writeback_centisecs=1500 to reduce writes to HDD. Don't forget to run sudo sysctl -p to apply the new configurations. Runtime power management for PCI-E devices, helps to save power power on low activity PCI-E devices. An one line script to set auto power management. sudo -i  # become root, then run the script bellow. I'm not going to play with the SATA link power management, as it may cause data loss. Here I mean use a network adapter technology which consumes less power. Ethernet is most power efficient, use ethernet cable whenever possible. However Gigabit ethernet is not power efficient, could draw up to 1 Watt of power. The second choice is bluetooth, if you are tethering from a phone, for this you have to enable bluetooth. Third choice is Wi-Fi, it consumes significantly more power than ethernet and bluetooth. Worst choice is mobile broadbrand, i.e. a GSM/CDMA modem, it could consume 2 to 2.5 watt power. Bloated desktops like KDE, Cinnamon, Unity draws much more power than lightweight desktops, as there are many background services, file indexing apps running on them. So It's good to choose a lightweight desktop environment like LXDE, LXQt or XFCE while running on battery power. Powertop is a great app for this purpose, it provides an easy to understand result and possible hints to optimize power management. In Debian, Ubuntu or any other derivative install powertop with apt-get. 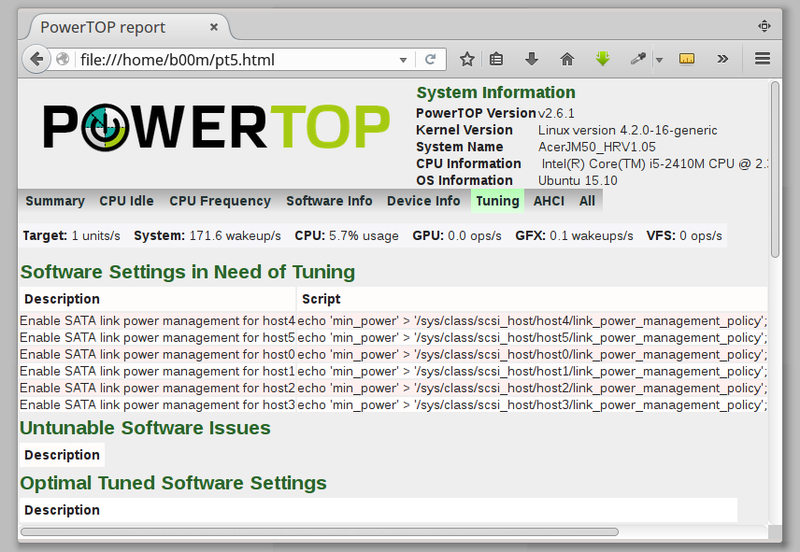 Now take a measurement and generate a report for 1 minuite in HTML format with the powertop command. Open up the HTML file with your favorite web browser and explore different results, the Tuning section is interesting. Enough linux power management and power saving tweaks, hope it's simple enough and most readers will find it useful. If you have any question or suggestion please leave comments, that will make this guide even better. Also share this tutorial with friends if you like it. Thanks for the feedback. Happy to know that you've found this guide useful. xbacklight not working and also the command is not working.Don't know about the grub.Display brightness still same.How do I fix this? Does the /sys/class/backlight/intel_backlight/ folder exists ? xbacklight won't work if ACPI backlight is configured properly. Try the second command too, if intel_backlight doesn't exists, try /sys/class/backlight/acpi_video0/brightness . Kon supratim ? Mahata babu ? Good tutorial, I got a good idea how Linux power management works. Thanks for your valuable feedback, keep visiting. Thanks Koushik, comment korar jonnyo. "Audio codec power management" exactly for this I was looking for, thanks for sharing the info.